We Brits like a good pick-up. I’m not talking about our nation’s Friday night proclivities of the greasy Weatherspoon variety. Instead, I’m referring to our seemingly growing desire to buy family transport that could embark on a transcontinental off-road expedition at any moment, without having to leave our collection of wooden pallets behind. They are bloody useful things. Useful enough for me to drive one myself (a Hilux, if you’re interested), and it spends a reasonable portion of its time up to its axles and with a bed full of wood. The recent trend by some (see Ford Ranger and VW Amarok) to soften their edges will no doubt widen their appeal, but there will always be those of us who expect our bakkies to work for a living. Mindful of this, when time came for Mitsubishi to design their latest Series 5 L200, they chose not to stray too far from a winning formula. 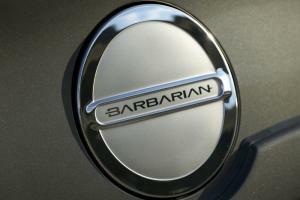 That said, the company claims to have made 330 individual improvements, and to put that to the test we spent a week with a Barbarian – their top-spec blinged-out model. 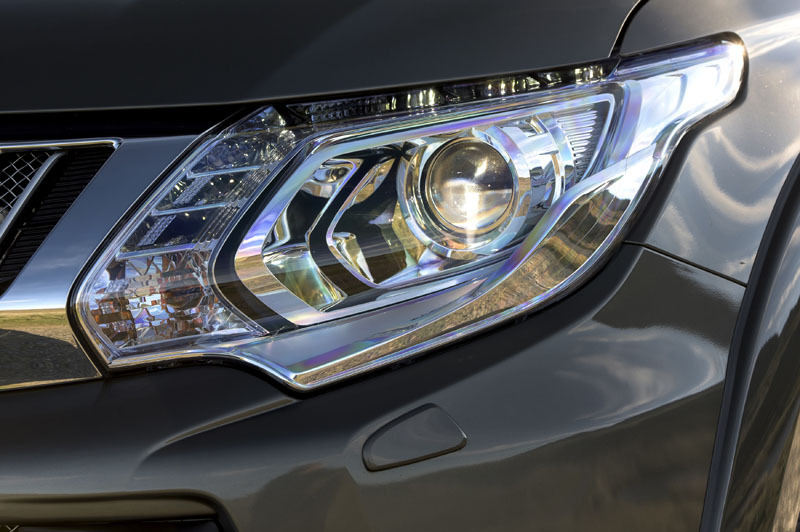 Some of the bolt-on elements are perhaps a little naff – the door handle recess covers, chrome-effect fuel filler, and the interior mood lighting that in reality is nothing more than a couple of number plate light holders stuck to the rear seat bases. 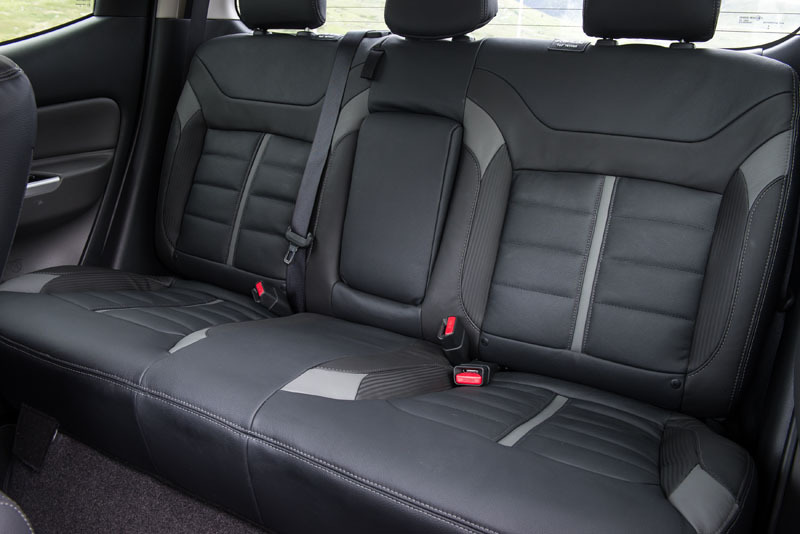 But some are far more successful: we love the damper that prevents the heavy tailgate from dropping open, and if you opt for the hard-top, it comes not only with opening side windows but also LED interior lighting and central locking. The bed is a touch smaller than the competition, though, at 1,470mm long compared to 1,545mm of the Hilux. 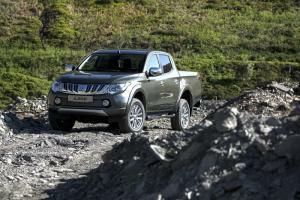 And it’s only rated to tow 3.1 tonnes at a time when the competition is offering 3.5. 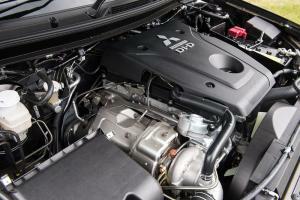 Not because it’s wanting in the power department: Series 5 L200s make use of a new all-aluminium 2.4-litre turbodiesel unit with 178bhp and 430Nm of torque, enough to knock nearly two seconds off the old model’s 0-62mph time. Admittedly it’s not the quietest engine in its segment, and the turbo makes a range of whistling noises not unlike a distant police siren, but it’s certainly not offensive. 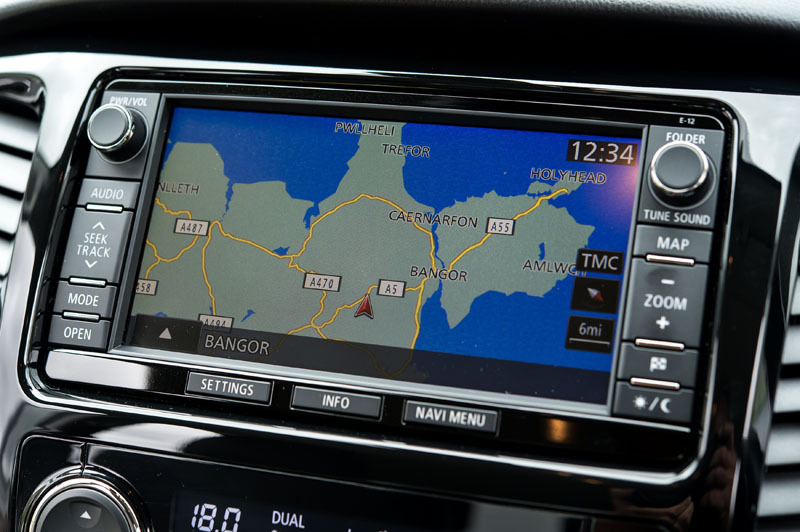 As standard, the six-speed manual transmission is usefully low-geared at the bottom end, although we chose to test the optional five-speed auto. 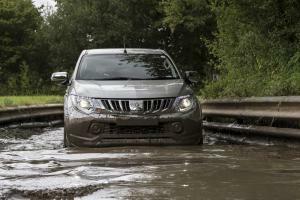 It’s a decidedly old-school unit, although other than a reluctance to lock-up the torque converter at times, it goes about its business without attracting attention to itself. Mitsubishi say the Series 5 uses substantially less fuel than its predecessor, and while we couldn’t match the official figure of 39.2 mpg, we had little trouble achieving a 34 mpg average and more than 500 miles to a tank. 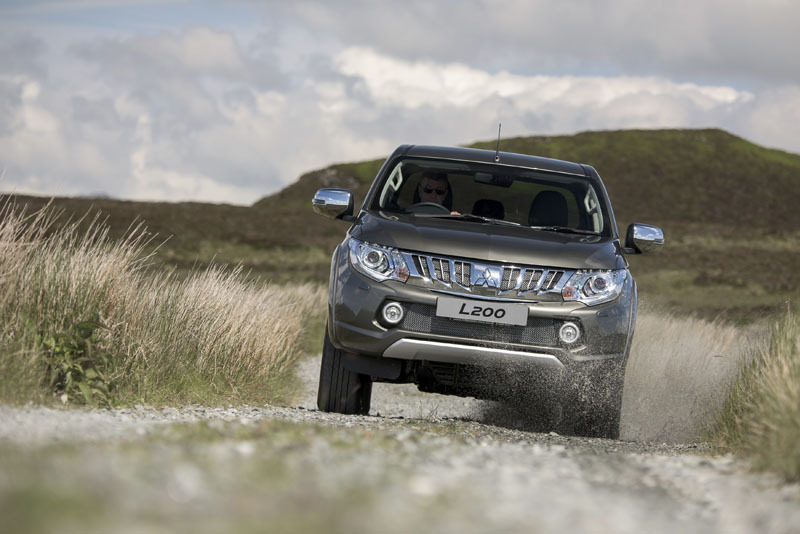 On a long journey, the L200 proved itself a perfectly comfortable travelling companion. 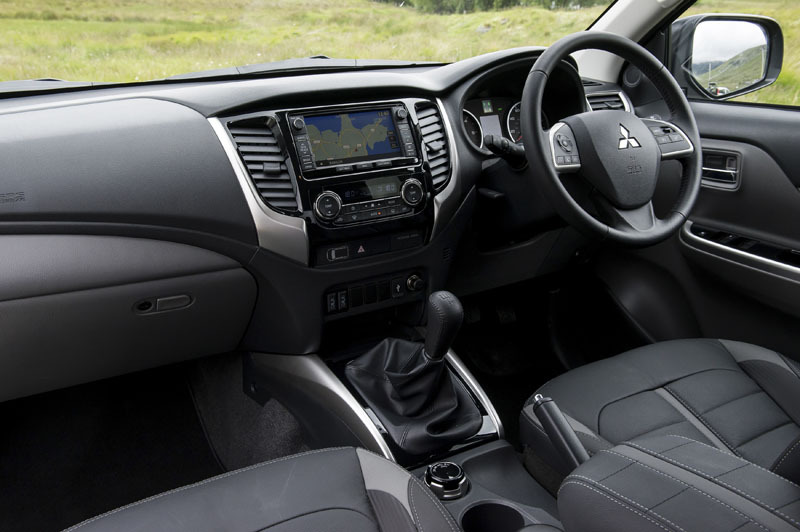 It doesn’t feel particularly unwieldy in traffic, despite its near 5.3-metre length, and boasts perhaps the tightest turning circle of any pick-up we can remember. 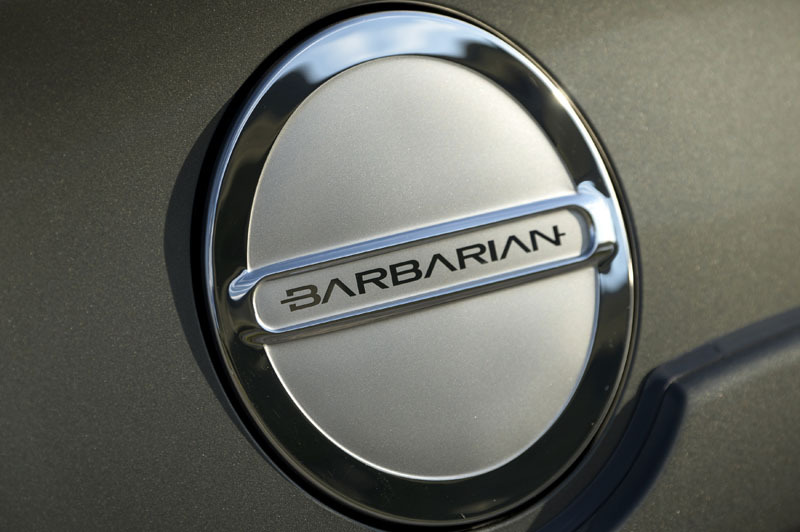 At 3.8 turns lock-to-lock, it’s hardly what you’d call pointy, but neither is it devoid of feedback. And while its solid rear axle and leaf springs unavoidably deliver a bouncy experience when unladen, its damping does an admirable job of keeping it all within the limits of comfort. 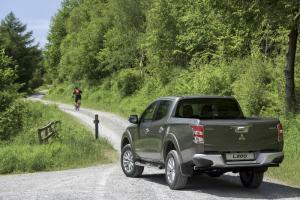 We wouldn’t object to stronger brakes, though; the L200 still makes do with drums at the rear. While both our car and another L200 we tried exhibited a mild wobble through the steering just the other side of 70mph – whether the result of poorly balanced wheels or something more fundamental we couldn’t ascertain. Minor niggles we discovered during a weekend spent in traffic on the M1 were restricted to the hard plastic on the door-mounted window controls digging into the legs of tall drivers, overly bright 4WD indicator lights in the dashboard (particularly at night), and a media and navigation system that – although perfectly serviceable – feels desperately aftermarket in comparison to the competition. But there is one area where the Mitsubishi scores a clear win: unusually for a pick-up, the L200 uses a Torsen centre differential that allows for a full-time 4WD option that can be used on the road, while other pick-ups make do with a part-time set-up that can’t. 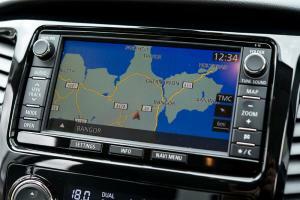 The system engages via a simple twist dial mounted by the gear-lever, and 4WD can be engaged at speeds of up to 62mph. A 4HLc setting locks the centre differential, while a low-range mode is for more serious off-road work. 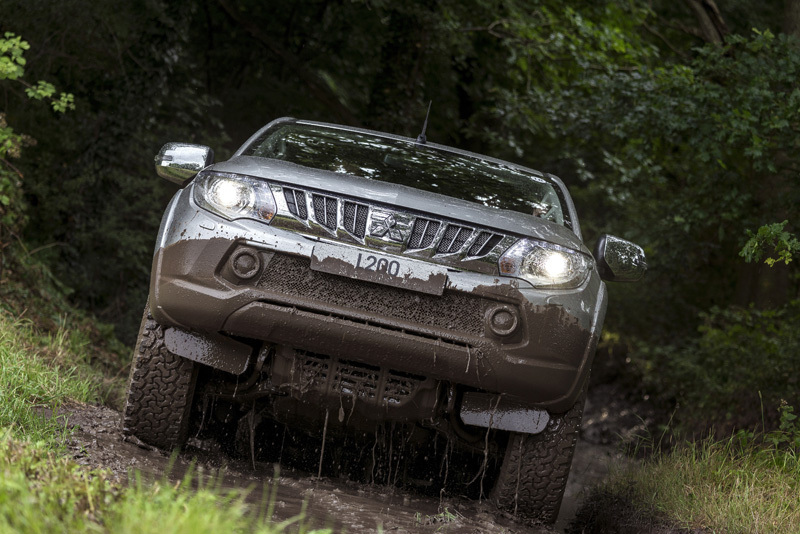 Testing on our woodland course revealed the L200’s willingness to keep on trucking wherever possible, although a rather low-slung tow bar limited its climbing ability somewhat. It’s undoubtedly more agile than behemoths like the Ranger and Amarok, but we did miss the locking rear differential of the Hilux. Prices for the new L200 start at £19,749 for the 4Life Double Cab (£23,698 with VAT), while our Barbarian Auto tipped the scales at £25,629 (£30,754 with VAT). For our money, the less blingy models have the greatest appeal, perhaps because of our view of these things as work tools first and foremost. Yes, it will happily take the kids to school, or a family of five on holiday with nary a complaint from the back seat. 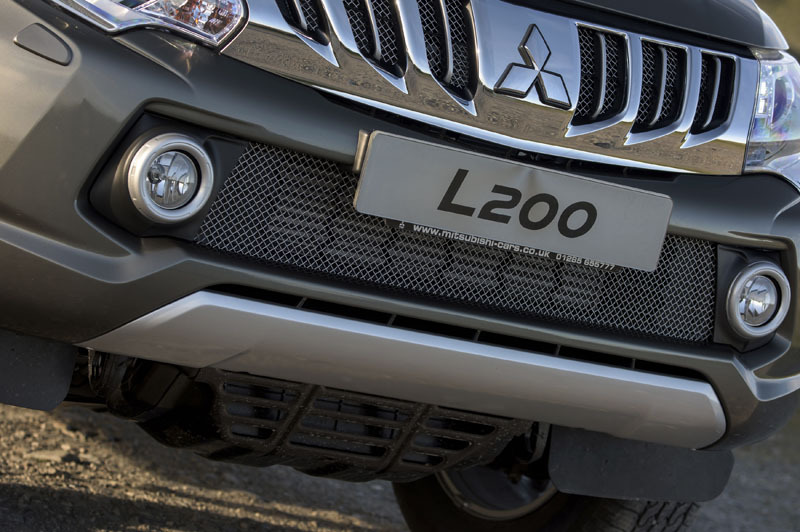 But at its heart, and despite some welcome nods towards the concept of comfort, the L200 remains a hard-working tool for hard-working people.